Compare prices on car hire in Mallorca from all the major brands and find the best deals. When you book through us, unlimited mileage and insurance are always included in the price given. Mallorca is the largest of the islands that make up the Balearic Islands and is home to approximately 800 000 people.In the early 50’s won this island many tourists’ hearts and has remained a high profile charter destination and remains a favorite destination for many. And with good reason. Epicureans, hikers as well as lovers looking for a romantic getaway can find what they’re looking for in Mallorca. Beaches, city and nature are the ingredients that covers all types of needs. A stable and warm climate been the biggest attraction over the years, but the island has more to offer than just sun. In the urban capital of Palma, the shopping-happy enjoying the fruits of that tourism has left its mark and left money in this vacation paradise for decades. 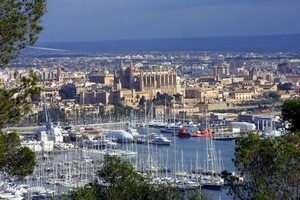 Mallorca has its own airport Palma de Mallorca (PMI) and is located about eight kilometers from the capital. Car Hire in Majorca is cheap through Car-hire.net. The prices provided to you in your search are compared from several well-known national and international car rental providers. This ensures our customers low prices on car rentals in Mallorca.